Y'all. Phoebe Howard is launching a home line (mostly bedding, I think) on QVC...TODAY. I love QVC and I love Phoebe. I've seen several designers go down this path of bringing lines to TV-shopping, but with the exception of Nate Berkus, I'm not sure anyone has really nailed it. So I have my hopes on Phoebe because that lady has some great taste. She will not lead us astray. 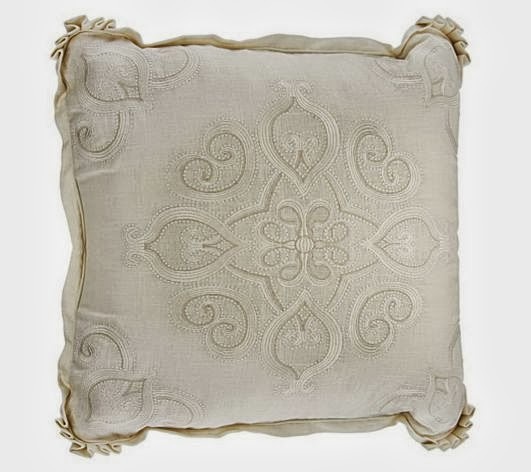 You can pick up the embroidered pillow above and other bedding items starting at 11:00 am EST - if you're home and can turn on the Q, I'm sure it will be a great show if only to watch Phoebe who is a nice, engaging personality. Next up on the House Tour is the living room! Enjoy your weekend...see you Monday!